Petting Zoo, Hay Rides, Pony Rides and More! See Nancy Fried-Tobin of the Good Earth Farm in this month’s “Letter from the Editor” too! often has found an animal living in a bad situation and helped the animal to recover and thrive. 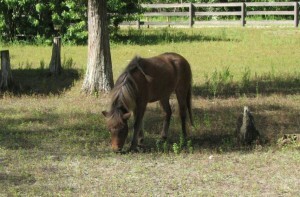 For example, she rescued a pony named Mickey, who was living in waist-high mud at another farm. The average life of a pony is 30 to 35 years old. Mickey went on to live a healthy life and lived until the age of 54. The local vet was in shock after checking up on this pony and finding out his age. It helps that Nancy is a Reiki practitioner; she has a gift of being able to heal with her hands. She has helped animals, kids and adults to heal. “I’ve had this gift since I was a kid,” explaining that she’s always been especially good with animals. “Now, later on in life, I know how to turn it on and turn it off.” In Hebrew, one’s mission is called her “Tikkun.” So after Nancy had a successful career in art and advertising in New York City, she found her Tikkun – taking care of animals. “This is way more gratifying,” says Nancy. owned “Smilin’ Acres Farm” in Plantation for fifteen years. There are many things to do at The Good Earth Farm, including “the zoo” held on Sundays from 10am to 3pm. 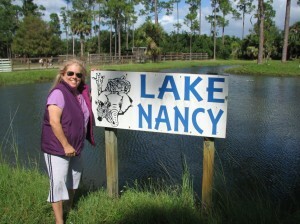 “You can walk around, relax, visit the animals, visit our café,” says Nancy. The Good Earth Farm is also the host of a lot of community service workers. She takes in people who work with the horses, groom them and clean up around the farm. “It’s good for them and it’s good for us,” says Nancy, explaining that working on the farm is more rewarding than many of the other community service opportunities out there. They also welcome volunteers, as long as the volunteer is able to commit to a regular schedule. Birthday parties are a lot of fun and custom-made at The Good Earth Farm. Normally held on Sunday afternoons, the birthday parties offer a group of kids the chance to connect with nature and animals, really spending time together. At the farm, they are the host of many kids’ groups, including The Boys and Girls Clubs, schools, camps, etc. For kids six and up, there’s a 4-H Club on Tuesday nights, beginning at 5pm. A parent accompanies the child, and they learn how to work with animals, animals showing and care. On Saturday afternoons, they offer group horse riding lessons, My Little Pony Class, for kids (ages 3 to 7) from 3pm to 4pm, limiting the class size to six children. The Good Earth Farm is the home of over 100 animals including ponies, horses, ducks, geese, parrots, peacocks, llamas, donkeys and a one-year old zebra named Ozzie. They just celebrated Ozzie’s birthday in October with a big birthday bash, which was open to the public. One of the more frustrating things that they encounter at The Good Earth Farm is people not being wise around animals. Nancy reminds us, “Animals have teeth – they can bite. 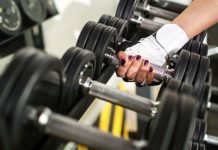 They have legs – they can kick.” It’s an ongoing education process of getting kids and adults to be careful around animals. Also the animals need to eat healthy, just as people do. So people always want to give the animals snacks when they visit the farm. “I tell them that the animals eat three times a day,” says Nancy, steering people away from giving the animals too many snacks. What does The Good Earth Farm need? Volunteers, says Nancy. A volunteer must commit to one day a week of work, must wear boots, sign a waiver and be 14 years of age and up. “If you love animals, this is a great place to be,” she says. Also, they would love for a local vet to donate their services to help the animals at The Good Earth Farm. 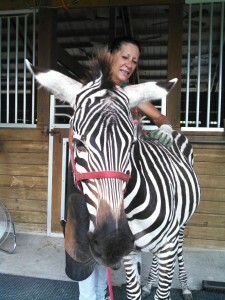 In the past year, they’ve had to pay for four colic surgeries for different animals. Meanwhile, it’s an expensive proposition to have a farm in this day and age, with one horse adding up to approximately $15,000 per year to take care of. 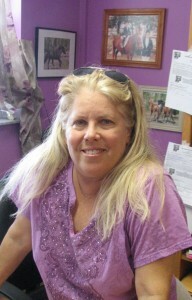 “People can sponsor a horse,” says Nancy. It’s a great way to give love and support to an animal, hosting the animal without having it live in your own backyard. They are also always in need of: shampoo (Head & Shoulders), towels and Clorox. Nancy is married to Alan Tobin, who’s handy with building things around the farm, and he enjoys giving the hayrides to kids. She’s the grandmother of a new baby girl Emmanuelle Sara, born in August. As for the future of Wellington, Nancy believes “Wellington needs to be the horse capital of the universe.” At the same time, she also says, “There’s something about the horse industry – it’s a snobbery that needs to stop.” She’s not shy about voicing her views, but Nancy is a vital voice among those who work with horses in our community. To experience all that The Good Earth Farm has to offer, visit their Sunday Zoo from 10am to 3pm, $10 per child and $8 per adult. Just take Okeechobee Blvd. West of 441 and go to the B Road. Turn right on the B Road and you will see the sign right away for The Good Earth Farm.